The team has to recreate the 3-D solid or "castle" (created by the designer) by asking as few questions as possible. You will be working in a team of four or five. You will need two sets of cubes (multilink or similar). 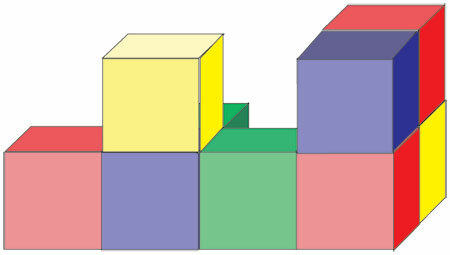 The image above uses nine cubes of four different colours. You might wish to start with a fixed number of cubes each of a different colour and then work with cubes of the same colour later. Give one set of cubes to the designer and the other identical set to the rest of the team. Without the rest of the group seeing, the designer creates a castle using some or all of the cubes available. Using the rules for asking questions, and checking that they all agree first, the team takes turns to ask the designer questions that will help them recreate the castle. When the team thinks they have the same castle as the designer they can check and the task ends. You are trying to recreate the castle using as few questions as possible. You do not have to use all the cubes. The cubes should be arranged so that each cube has at least one full face touching another cube and all faces must fit together exactly (no overlaps). You only answer questions of the agreed type. any holes or gaps in the castle. count the number of questions the team ask. Volume and capacity. Polyhedra. PrimaryCollaborative. Surface and surface area. Team-building. Nets. Visualising. 2D representations of 3D shapes. Cubes & cuboids. Interactivities.